Help Us Fund ABQ CiQlovía + Parquitos! These two tactical urbanist projects will catalyze a more Urban ABQ. It has been awhile since I’ve posted here because we at UrbanABQ have been very busy. We have two IndieGoGo (similar to Kickstarter) campaigns to share with you. 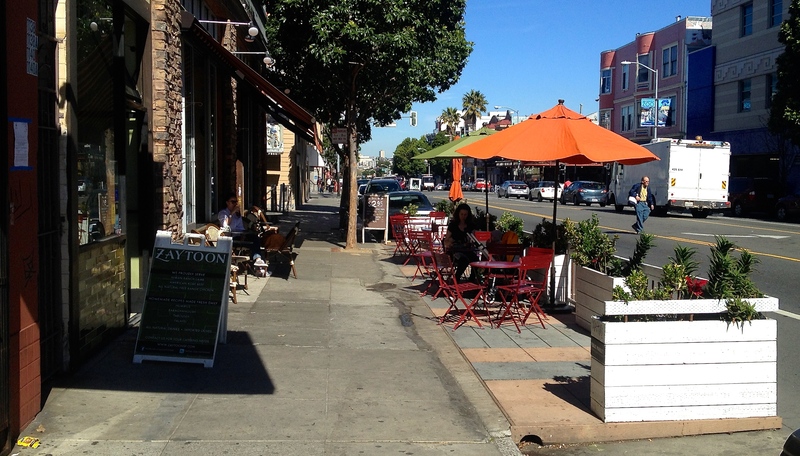 1) Parquitos – Parquitos, or parklets as they’re known in other cities, are on-street parking spaces which have been converted to small outdoor seating areas. They can be found all over the country but there are no permanent ones in Albuquerque… yet. On September 19, National (Park)ing Day will mark the fabrication kickoff of the FIRST permanent parquito in the Duke City. Tim Trujillo, with the help of the MiABQ Green Team, UrbanABQ, Zendo Coffee + Art and many others, has been working on this project for over a year. It is so exciting to see it finally coming to fruition! This campaign will be ending in 24 hours and we need YOUR help to make parquitos a reality! 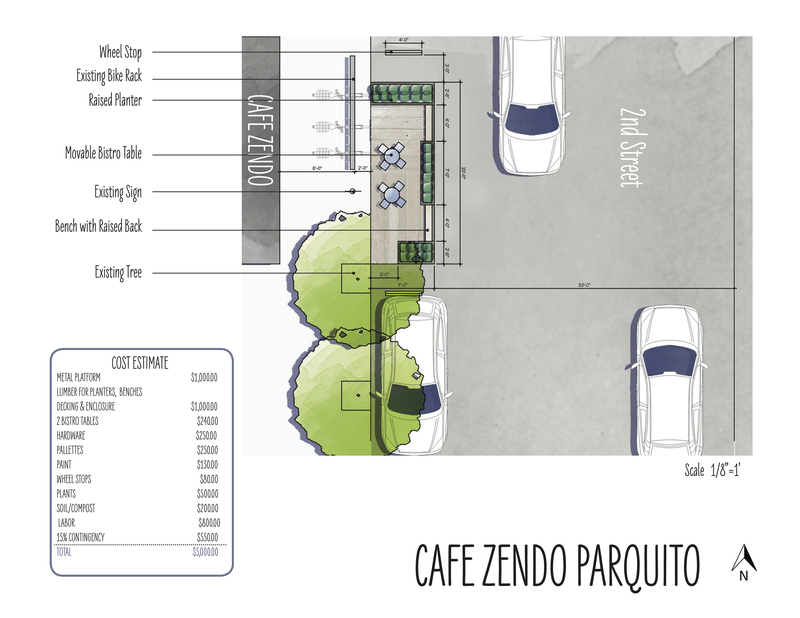 Click here to contribute to the Zendo Parquito! Parklet on Valencia St. in San Fransisco. If all goes as planned, these will soon be appearing all over Albuquerque! 2) ABQ CiQlovía – IMAGINE… if everyone in our city, no matter age, ability or skill level could safely and easily walk, bike or play in our city streets. 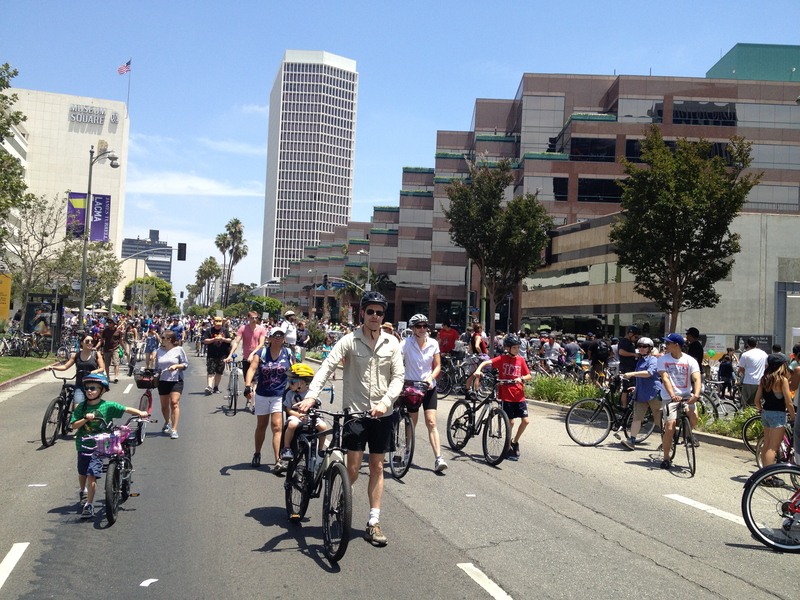 IMAGINE… no automobiles to worry about, just two miles of city streets for walking, riding and playing. The first open streets event in Albuquerque, NM! On Sunday, September 21, from 10 AM – 3 PM, this dream will become a reality. For five hours, people from all over the Duke City will fill the streets. Walking, biking, running, rollerblading, food trucks, outdoor yoga, live music… this will be the largest street party Albuquerque has ever seen! Bring your friends and family and hang out in the streets! 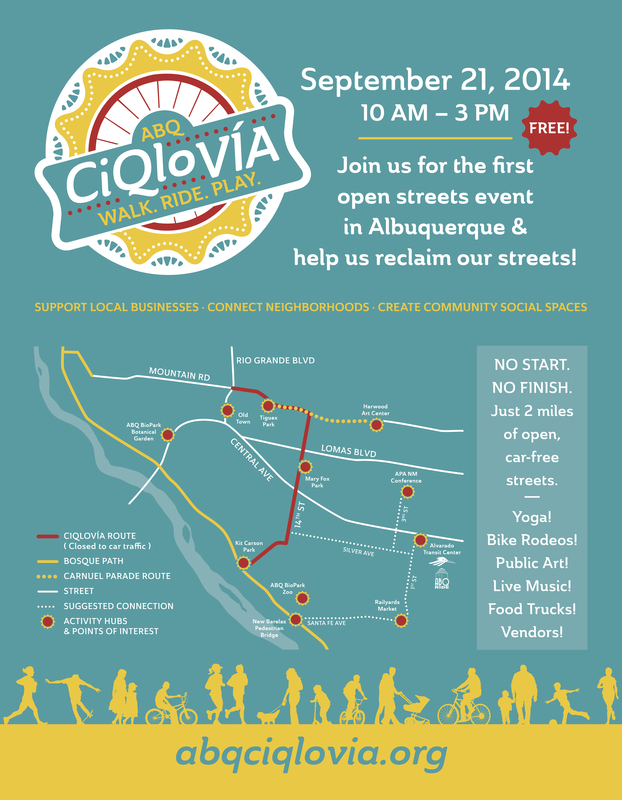 We are hoping ABQ CiQlovía will accomplish what open streets events have accomplished in Los Angeles, Tucson and many other cities: catalyze the broader community to push for safe streets for biking and walking – complete streets! Today in Albuquerque, few people choose to walk or bike for transportation because our streets are scary and dangerous. Communities across America are realizing the value of safe walking and biking but here in Albuquerque, progressive policies around these ideas have stagnated. We hope to bring new energy to this important movement through fun events such as ABQ CiQlovía. 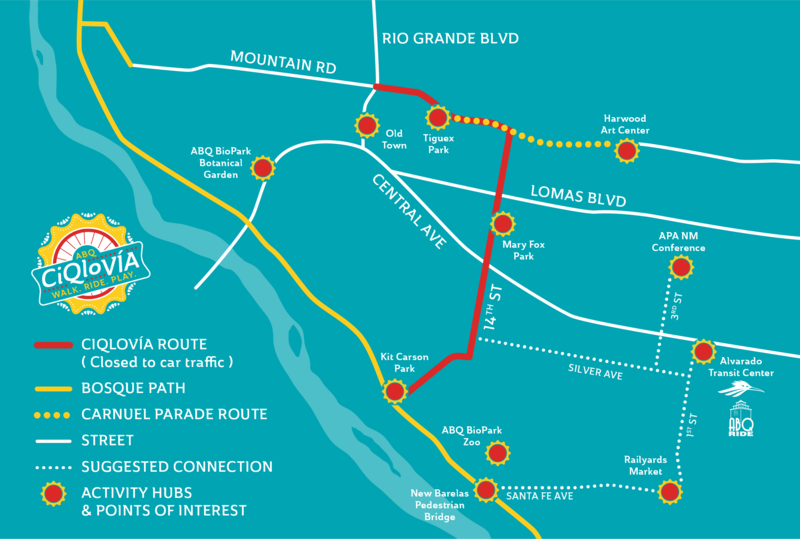 Our route map includes other exciting partners such as the Carnuel Parade and Fiesta as well as the Railyards Market. This campaign will be ending in 72 HOURS and we need YOUR help to make ABQ CiQlovía a reality! Click here to contribute to the First ABQ CiQlovía! Every dollar helps this project come to fruition! For more information, visit our website, abqciqlovia.org. We also have a Facebook page! It is critically important that you, the community, help us complete this projects. In order to build a better, more urban ABQ, it will take grassroots efforts and funding streams to move these ambitious ideas forward. We look towards a future where all of these types of projects and events are integrated into the local funding streams but it will require a community push to accomplish these goals. Can you contribute? If so, great! If not, please share this with your friends and colleagues. We also have many volunteer opportunities so please follow our Facebook pages, email lists and websites!